Lansium domesticum corr. is a member of the family Meliaceae, and known locally as duku and has been used traditionally in the prevention and treatment of various illness. To study the cytotoxic effect and morphological changes of human colorectal adenocarcinoma cells (HT-29) treated with different duku (Lansium domesticum corr.) extracts. The L.domesticum corr.fruit extracts were processed involving three different solvents; methanol, ethanol and ethyl acetate. HT-29 cell lines were treated with different concentrations of L. domesticum corr. (0-100 μg/ml) extracts for a total of 24, 48 and 72 hours. Cytotoxicity of cells line was determined by using MTT assay as per IC50 values. Methanol extract of L. domesticum corr. showed IC50 value at 6.79 ± 0.00 μg/ml and 50.0 ± 0.00 μg/ml respective, while ethyl acetate extract of L. domesticum corr. reached IC50 value at 86.00 ± 0.08 μg/ml, and 96.0 ± 0.12 μg/ml. There was no IC50 value of ethanol extract from L.domesticum corr. Only methanol extract showed toxicity towards HT-29 cells line. To the best of our knowledge, this is the first repeat the exploring the effect of duku(L. domesticum corr.) extract on HT-29 cells line. Anti-proliferative effect, colorectal cancer, MTT assay, polarity extracts, IC50 value. Three different polarity solvents were used to extract duku fruits which is methanol, ethanol and ethyl acetate. Extraction of duku fruits (L. domesticum corr.) shows cytotoxicity effect to HT-29 cells line. Methanol and ethyl acetate extraction of L. domesticum corr. have potential in inhibiting the growth of HT-29 cells line. Morphology of HT-29 cells line changed and continuous exhibited characteristics features of cell. To the best of our knowledge, this is the first repeat the exploring the effect of duku extraction on HT-29 cells line. The genus, L. domesticumcorr. belongs to the family Meliaceae, and known locally as duku. Duku is a famous fruit in Southeast Asia, beside Malaysia, Thailand, Philippines and Indonesia being its’ biggest producers.10 The tree grows to a peak of 40–50 feet (ft) with long leaves that are pinnate and dark green.11 The raw dukufruits are greenish in colour and have a very sour-gummy taste.As the fruit matures, the skin will turn yellowish, the fruit’s flesh will become sweet and can be eaten freshly. The nutritional composition of 100 grams of duku is reported to contain 70-74 calories, includes of 1.0-1.5 g protein, 0.2-0.5 g fat and 13-15 g carbohydrates.12 Traditionally, the bark trees and seed of the duku used to treat dysentery, eradicate cancer cells13 as anti-pyretic and anthelmintic. Lately, researchers have focused on potential of dukuas having anti-malarial,14 anti-cancerous15 and anti-bacterial properties. This study focused on the screening the cytotoxic effect of L. domesticum corr. extracts towards, studying the morphological changes of human colorectal adenocarcinoma cells lines (HT-29). For processing extraction, method described previous was used.15 The duku fruits (L. domesticum corr.) were obtained from Kuala Terengganu, Terengganu, Malaysia. The fruits were skin peeled and carefully washed under running tap water, dried with a soft cloth and macerated. A total of 10 g of the macerated fruit sample was soaked into three different polar solvents namely, ethanol, methanol and ethyl acetate with in a ratio of 1:10; w/v for 24-hours. Then, all the extracts from all solvent were filtered using Whatmann® No. 41 filter paper (pore size 20-25 µm) and were then concentrated under reduced pressure at 40°C. All the extracts were stored at -20°C until a total of used for further analysis. For screening the extracts of the duku fruit (L. domesticum corr. ), 100 mg of the sample was dissolved in 1mL of DMSO to obtain 100 mg/mL stock solution of extracts. All extracts were kept at a temperature of 4°C throughout the experiment. Stock solutions were further diluted in a RPMI 1640 (Sigma, MO, USA) media to obtain a final concentration of 100 ug/mL. The human colorectal adenocarcinoma cells (HT-29) were purchased and maintained at a temperature of 370C, in a humidified CO2 incubator with 5% CO2 in a RPMI-1640 media supplemented with 10% fetal bovine serum and at 95% relative humidity, while changing the media at least twice a week for harvesting. According to Mosmann,16 the anti-proliferative activity of the L. domesticum corr. extracts were obtained using ethanol, methanol and ethyl acetate solvents via micro-titration colorimetric method of tetrazolium salt reduction. The viability of cells used was determined by the trypan blue method. Exponentially, cells were harvested, enumerated using the haemocytometer and diluted with a particular medium. A total cell volume with a concentration of 2 x cells/cm2 was prepared and plated (100 µl/well) into 96-well plate (SPL Life Sciences, Korea). After a 24-hour recovery period, a serial dilution of L. domesticum corr. samples was plated out, in triplicates. Each plate was included with untreated cells as controls and a blank cell-free control. After 0, 24, 48 and 72 hours of incubation, tetrazolium salt 3- [4, 5- dimethylthiazol-2-yl]-2-5-diphenyltetrazolium bromide (MTT) (20 µg/mL) was added to each well and plate was re-incubated for a further 4 hours. The media then was removed and DMSO 100 μl) was pipetted into each well to solubilize the formazan crystals and incubated for another 15 minutes.Finally, the absorbance was measured at 570 nm using a flourometer micro-plate reader (Tecan, Infinite M2000) and the percentage of cell viability was calculated with the appropriate controls taken into account. The relative viability of the treated cells as compared to the control cells was expressed as the % cell viability; (% cell viability = [A570 of treated cells]/ [A570 of control cells] x 100%). The inhibition concentration (IC50) will then determine by non-linear regression analysis of the corresponding dose response curve. HT-29 cells line were grown in 4 plates and treated with extract residue from the fruit extract obtained using ethanol, methanol and ethyl acetate as a solvent. The morphological study was conducted at a temperature of 37°C for duration of 0, 24, 48 and 72 hours; morphological changes occurring in the cells were observed under an inverted microscope (Nikon, Japan). The SPSS 20.0 software was employed for statistical analysis. Data were expressed as mean ± SD of three independent values. The cytotoxicity effect of L. domesticum corr. was measured in triplicate for every extract against untreated cells for an interval of 24 hours’, 48 hours’ and 72 hours’ incubation, respectively. The effect of methanol, ethanol and ethyl acetate extract on HT-29 cells line is shown in Figure 1 and Table 1. The value of IC50 for anti-proliferative effect of methanol extract L.domesticum corr. at 48 hours’ treatment was found to be; 50.0±0.00 µg/ml, while treatment at 72 hours shown that IC50 value is 6.79±0.00 µg/ml. For ethyl acetate extract, anti-proliferative effect showed IC50valueat 24 hours’, treatment with 86.00±0.08 µg/ml and at 72 hours’ treatment with 96.0±0.12 µg/ml. Meanwhile, ethanol extract had no anti-proliferative effect on HT-29 cells line as none of ethanol extract reached IC50. Cell morphology study was assessed at 24, 48 and 72 hours after treatment with L.domesticum corr.extract [Figure 2]. In the experiment, under treated control conditions (0 hours), cells appeared healthy and grew up to 90% of confluency in methanol, ethanol and ethyl acetate extracts. For methanol extract, HT-29cells line slowly exhibited the characteristic features of loss normal shape with some cell floating after 48 hours. After 72 hours, around 40% cells line continues to exhibit progressive characteristic features of HT-29 cells. Meanwhile, in ethyl acetate extract after 24 hours, there are few cells that looked smaller in size or shrunk, stated as per N/C ratio (nuclear-cytoplasmic ratio).After 48 hours, 5-10% cell slowly exhibiting the characteristic features of loss in normal shape with few cells floating in the medium and increased to be about 20% after 72 hours’ treatment but in slow progress. 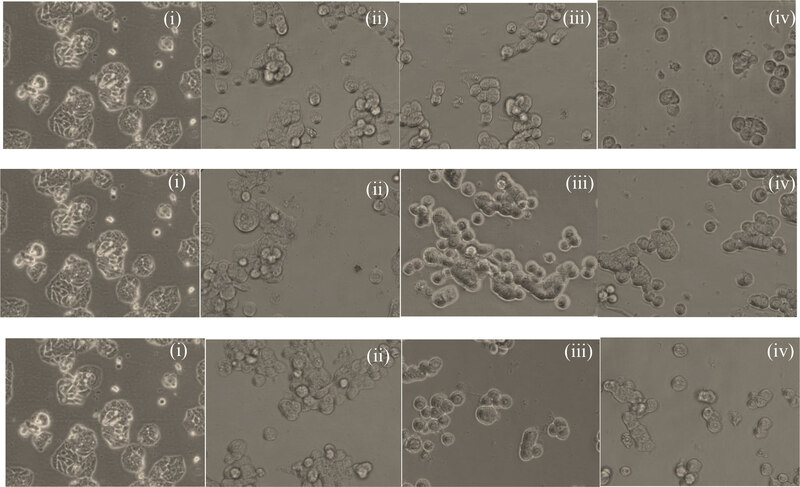 On the other hand, the other intervals of after 24 hours’ treatment with methanol extract and after 24, 48, 72 hours’ treatment with ethanol extract showed that the HT-29cells exhibited the characteristic features of blabbing and polygonal shape, as compared to control conditions (0 hours).There is no major presence of cell shrinkage, rounding and partial detachment, floating of cell and lobulated appearance to be apoptotic cells. The cytotoxicity activity of L. domesticum corr. different extracts on the growth of the HT-29 cells is shown in Table 1. According to the National Cancer Institute standards, crude extracts’ possessing an IC50 value of less than 20 µg/mL are considered to be active, potential cytotoxic extract against tested cancer cells.17 Among the three extracts of L. domesticum corr., methanol and ethyl acetate extracts were found to inhibit the proliferation of cells line at IC50.The degree of proliferative inhibiting is defined as a concentration that reduces the number of cells to be 50% as compared to the untreated (IC50). However, only methanol extract from L. domesticum corr. was found as a potential cytotoxic extract to HT-29 cells line at concentration 6.79±0.00 µg/ml. The extract was also found to be sensitive towards the inhibition of HT-29 cells proliferation compared to ethanol and ethyl acetate extracts. Anti-proliferative effect of HT-29 cells line by methanol, ethanol and ethyl acetate extracts of L. domesticum corr. Inhibition of human colorectal adenocarcinoma cells line (HT-29) by methanol, ethanol and ethyl acetate extract of L.domesticum corr.fruit on time dependent at 0 hours, 24 hours, 48 hours and 72 hours. Inhibition of human colorectal adenocarcinoma cells line (HT-29) by methanol (A. ), ethanol (B.) and ethyl acetate (C.) extract of L. domesticum corr.fruits for 3 days. Cell morphology of HT-29 was examined after being treated with (i) IC50 at 0 hours, (ii) IC50 at 24 hours, (iii) IC50 at 48 hours and (iv) IC50 at 72 hours. The photographs were taken at x20 magnification with inverted microscope (Nikon, Japan). This study aimed for screening the cytotoxicity effect of L. domesticum corr. extracts towards study the morphological changes of human colorectal adenocarcinoma cellsline (HT-29). The study showed that methanol and ethyl acetate extraction of L. domesticum corr.have potential in inhibiting the growth of HT-29 cells without any toxic effect. 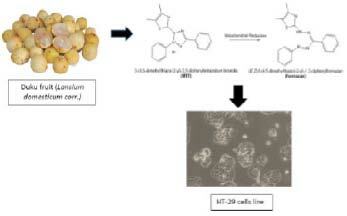 While, ethanol extract showed no IC50 value obtained.Morphology of HT-29 cells line changed and continues exhibited characteristic features of cell, but slowly progressing after treatment with methanol extract, but none of concentration showed toxic. Further studies are required to reveal the important chemical constituents and bioactive molecules, responsible for anti-proliferative activity. The authors would like to thank the Ministry of Higher Education, Malaysia and Universiti Sultan ZainalAbidin (UniSZA) for the financial aid (UNISZA/2015/DKP/23) and the Faculty of Health Sciences for providing the facilities. The authors would also like to acknowledge all staffs from Teaching Laboratory 1, Faculty of Medicine and Faculty of Health Sciences, UniSZA. No conflict of interests exist. American Cancer Society. Colorectal cancer. 2015;Available from http://www.cancer.org/cancer/colonandrectumcancer/detailedguide/colorectal-cancer-what-is-colorectal-cancer. Dr. Mohd Adzim Khalili Rohin: Got his undergraduate degree and postgraduate degree from Universiti Putra Malaysia (UPM) in Food Study (1999 – 2002) and Community Nutrition (2003 – 2006). 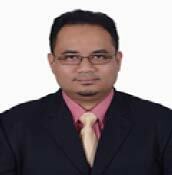 He finished PhD in Functional Food and Nutraceuticals (2009 – 2014) from Universiti Sultan Zainal Abidin (UniSZA). Work as Director, Centre for Continuing Education and Senior Lecturer at Universiti Sultan Zainal Abidin (UniSZA). Currently on research functional food towards opioid dependence study.